True Eco Dry LLC Can Repair Your Carpet! True Eco Dry LLC understands that new carpeting and installation is expensive. We are experts in repairing carpeting and restoring it to like new condition, saving our customers money and time. Whether your carpeting has become loose, or you are tripping over waves and ripples in your carpet, call True Eco Dry LLC for your carpet repair needs. We have the tools and know how to complete your carpet stretching and carpet repair job. Our technicians are experts in matching patches and repairing seams. When we're done, you'll have a tough time remembering where the problem was! A properly installed carpet should not develop ripples. If your carpet was recently installed, you should contact your installer and have them correct the problem. Over the years, carpet can develop wrinkles and ripples, or it may just feel “loose”. 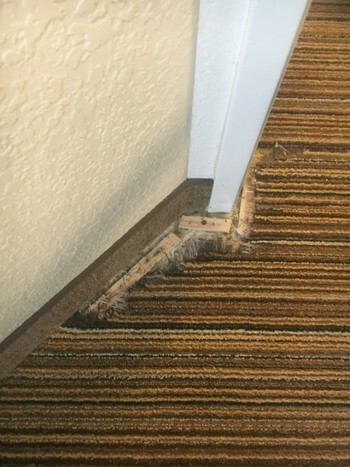 True Eco Dry LLC uses the proper tools and techniques to re-stretch your carpet, making it tight and secure. If you have a stain that cannot be removed, or damage such as a burn, your best bet may be a carpet patch. True Eco Dry LLC will remove the damaged section and replace with a left over piece, or a piece that we can remove from an inconspicuous place, such as a closet. We'll install the patch and make your problem area disappear. Berber carpeting is beautiful and easy to clean, but it also snags. Whether from the family pet or a child's toy, Berber carpet can develop pulls. True Eco Dry LLC can repair your Berber. After assessing the problem, we'll come up with the most cost effective solution. For example, if just one row was pulled, we can “re-burl” the carpet. If a larger area is involved, we may need to patch the area. Your Berber carpet can also be stretched in the same way we stretch other types of carpeting. Many people choose to install their own hard flooring, such as tile or linoleum. However, they often have trouble with the borders. If you've just laid flooring and need assistance with your floor to carpet transition, give the experts at True Eco Dry LLC a call.